ASIAN naphtha-to-polyethylene (PE) spreads collapsed by 80% in the first week of January compared with December last year because of the failure to pass on the rise in naphtha feedstock costs resulting from higher oil prices. 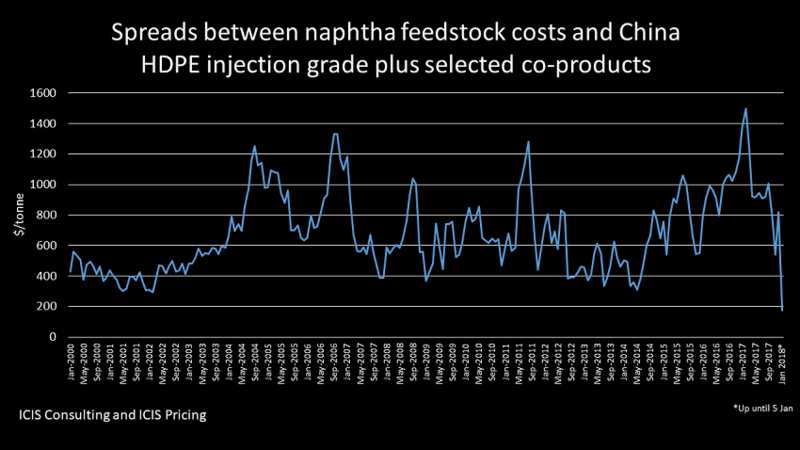 In an update of the chart I’ve been running since late last year, what you see are the spreads between naphtha costs and a tonne of high-density PE (HDPE) injection grade plus selected co-products. I takes 3.3 tonnes of naphtha to make a tonne of ethylene. Just over a tonne of ethylene makes a tonne of PE). When you crack 3.3 tonnes of naphtha you also get 0.52 tonnes of a tonne of propylene, 0.33 tonnes of a C4 olefins and 0.75 tonnes of aromatics. So it is a straightforward job to work out these values, times the relevant multiples, using ICIS pricing history. You then add these values to the price of a tonne of HDPE to get the combined spread between all the product values and naphtha costs. Missing are other co-products, such as hydrogen and fuel-oil type products. But you get a general and acceptably accurate picture. In November 2017, spreads fell to $541/tonne from $792/tonne in October. The November spread compared with the January-October 2015 average of $1,018/tonne. In December, spreads bounced back to a pretty healthy $820/tonne. But, based on ICIS pricing assessments for the week ending 5 January spreads have fallen to just $176/tonne – 80% lower than those for the full month of December. This would represent the lowest monthly level in at least 18 years if this trend were to continue throughout January. This obviously tells us that Asian naphtha cracker operators are struggling to pass on higher feedstock costs to their customers. In a strong demand environment, the cost pass-through would not be a problem. This runs counter to all the complacent talk of a synchronised global economic recovery. So, what’s going on? 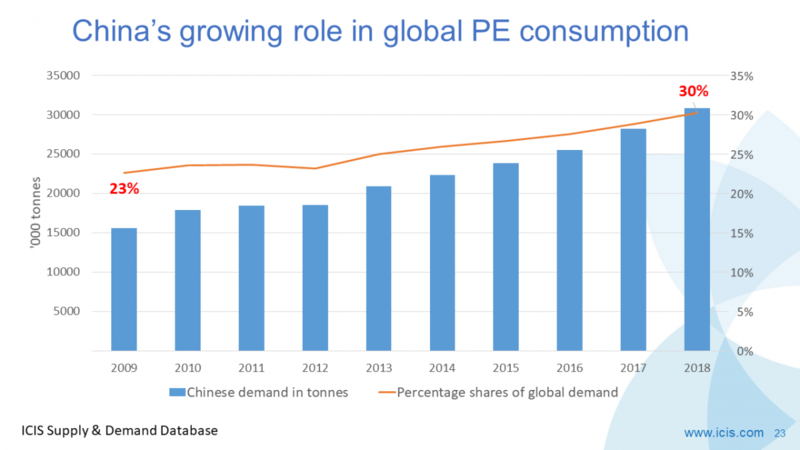 China’s PE imports continued to surge in Q4 after what had already been a very strong year for growth. 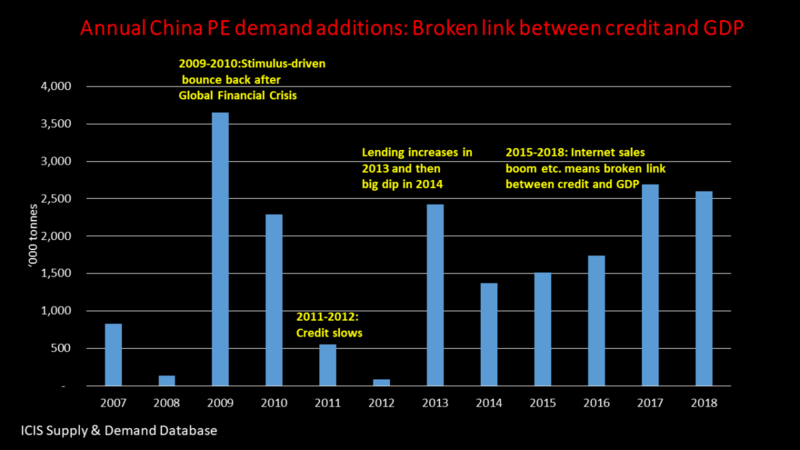 This suggests substantial buying ahead by PE converters and traders. 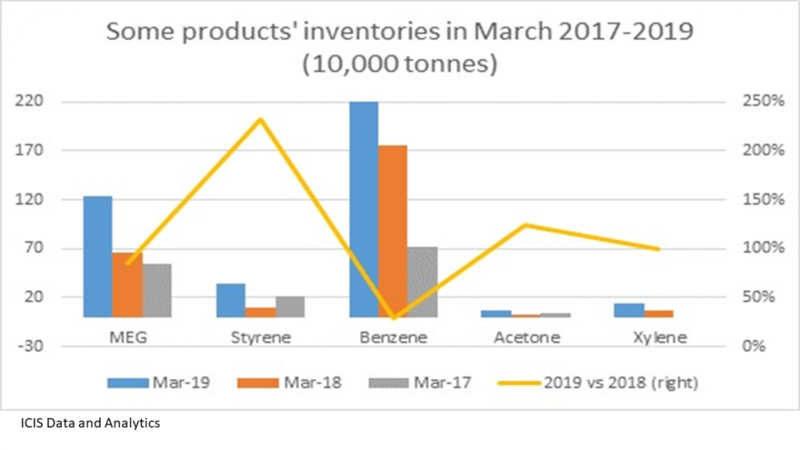 It is more than likely that they stocked-up on resin ahead of anticipated further increases in oil prices, naphtha costs and in turn PE prices. But PE prices in December and so far this year barely moved because of a.) The high inventory levels resulting from this stock-building, and b.) 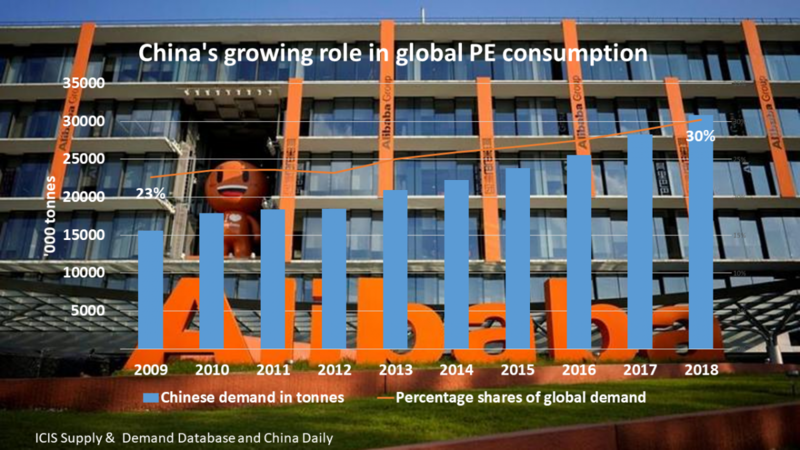 The start-up of new Chinese PE capacities. In March, as we shall detail in our January ICIS Asian PE Monthly Price Forecast Report, 700,000 tonnes/year of new capacity is due on stream. This follows the commissioning of 920,000 tonnes/year of new capacity in H2 2017. The Lunar New Year holidays are also only just around the corner. Just about the whole of China will shut down on 15-21 February, meaning that buying activity will soon decline. A further dampener of economic activity is the winter air-pollution campaign that has led to the closure of plastic processors. The campaign comes to an end in mid-March. 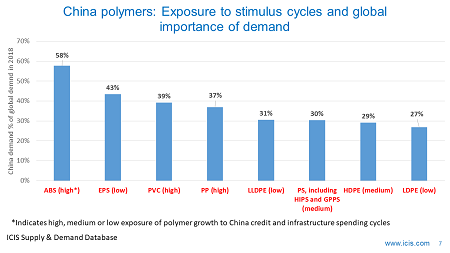 As a result, I forecast that China PE pricing across three major grades (HDPE injection grade, low-density PE film grade and C4 linear-low density PE film grade) will only edge-up in January despite much stronger crude and naphtha. I then expect prices to fall in February and December. Subscribe to my report for the actual numbers. Q1 is going to see a squeeze on profitability. This will perhaps not be as severe as the first week of January when trading volumes will have been thin. But I expect that cracker operators will continue to struggle to pass-on higher naphtha costs. I could obviously end up with proverbial egg on my face. That’s always the risk of forecasting. But my aim is to help petrochemicals companies adequately plan for the future by building sensible scenarios. If I merely repeated the conventional wisdom I would be falling short of this objective. The coordinated withdrawal of monetary stimulus by Western central banks and anything between slightly slower and much slower Chinese economic growth. 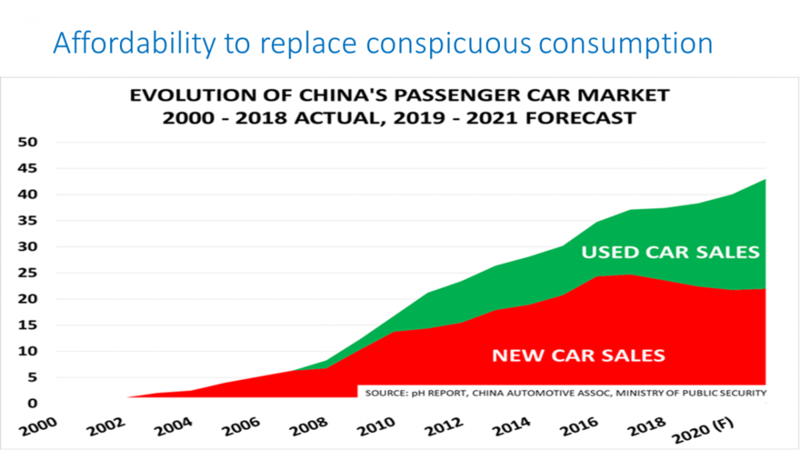 China’s environmental clean-up campaign and its effect on global inflation. China has switched from exporting deflation to exporting inflation as a result of a huge programme of manufacturing shutdowns. Western central banks are already, as described in Point 1, set to pull back on their bond buying and raise interest rates. Rate rises may have to be higher than planned because of the China inflation effect. Even further inflationary momentum could be generated by oil prices. $70 a barrel or more? Perfectly possible in 2018 because of geopolitics. Protectionism. We were lucky in 2017 as we got away with no global trade war. But the new US National Security Strategy is a reminder that the protectionist threat hasn’t gone away. What would happen if there was a major fallout between the US and China? How would US PE producers place all of their new volumes? They would either have to delay plants or flood alternative markets. 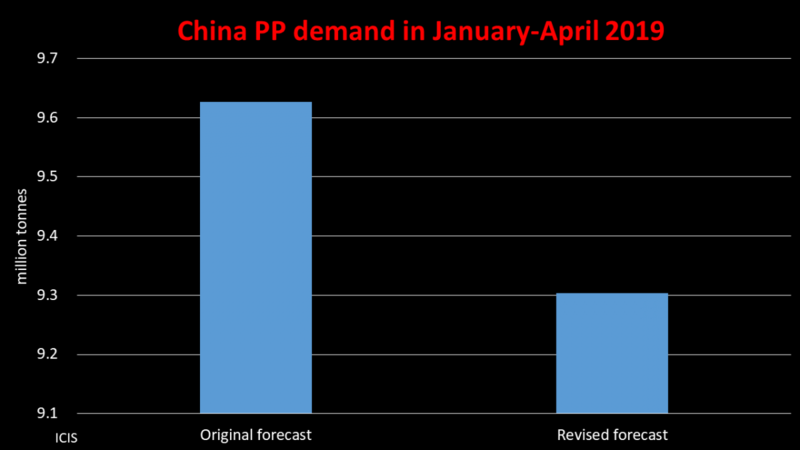 Here is a reminder of a key statistic: Only around 5% of last year’s Chinese PE imports came from the US. Banning US imports might thus be a very manageable task for China. All the above wouldn’t matter if it wasn’t for today’s demographic headwinds. 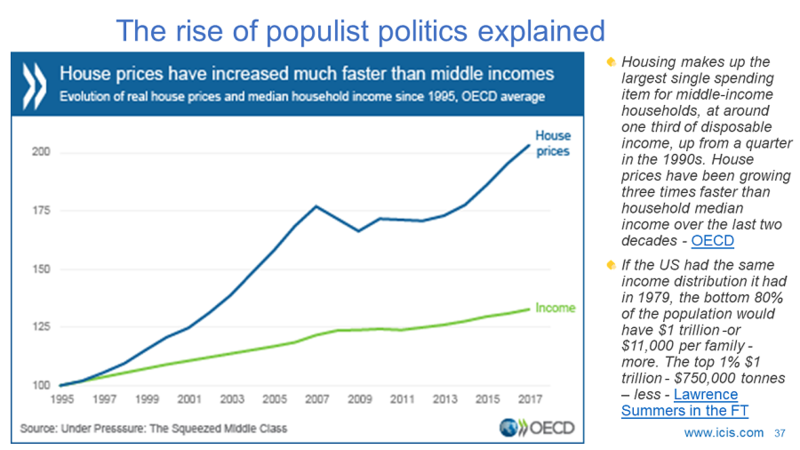 But the ageing of the Babyboomers means that we will feel every economic bump in the road, far more than was the case during the Economic Supercycle. I could, as I said, so easily be wrong. This year may turn out to be another stellar year because of the truth behind the overused phrase, “a synchronised global economic growth”. But exactly why is the recovery global, why is it synchronised and why will it continue? And precisely how will this recovery be sufficiently strong to overcome my five big areas of challenge? I would advise going through my challenges one by one in front of your boards of directors. Alternatively, you could follow the crowd and merely tell your board with hardly any further elaboration, “We are in the middle of synchronised global economic recovery which will carry on for the rest of this year”. This approach would place your career and the profitability of your company and at unacceptably high risk.